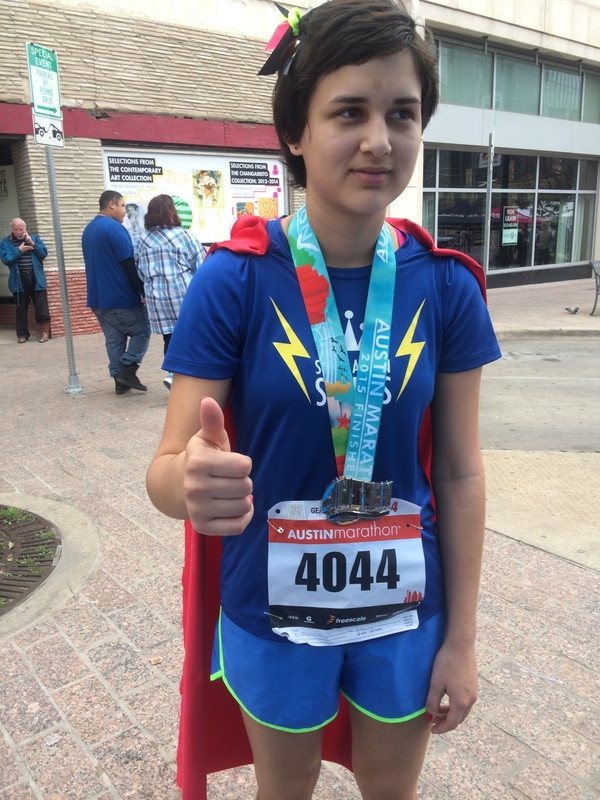 Zane at the completion of the 2015 Austin Marathon. Marathon High kind of snuck up on me junior year. One of my teachers made a random presentation to my gym class, and talked about his experience with marathons. I don’t recall a lot of what he said, but he mentioned that it didn’t matter how long it took you or who passed you and how he didn’t consider you a “real person” unless you had run a marathon. He made it sound fun and low pressure, and it seemed ideal for someone who was too afraid of the stress and competition that goes with the track and cross country teams. I couldn’t stop thinking about it, and bothered my friends constantly about going to one of the practices with me, and continuously asked them if it was a good idea, and what they thought and they’d pressure me to just go already….And then I finally got up the courage to try it out. I was relieved to find that I knew some of the members, and that it wasn’t quite as frightening as I’d thought. My first day we ran a loop that goes down Manchaca, goes just past Half Price Books, and comes back up Lamar, which turned out to be around a mile and a half, the longest distance I’d run at that point. It felt pretty good; I actually remember thinking that I could keep going. So I kept coming to practice, and then the races, and I never quite left. It got me kind of obsessive for a while; after it ended that first year I’d get up super early (early to me) to have time to eat, digest, run, shower, get dressed, make lunch, eat the other half of breakfast and get to school. I don’t remember about Saturday runs, but I went often enough on my own to keep fit. During the summer, I went to Saturday Rogue runs with Lenora’s group and met some more running peeps, and continued my own weekly runs (though several hours later). I did stop toward the end of summer, but got back into it when the Marathon High season started up again. People seem to be surprised that I came back. I didn’t finish the marathon as happy as others, but I never said I wasn’t going to do it again. I came back simply because I couldn’t imagine not going back. Thinking that way also got me through my first marathon; my mom said she didn’t think I could (I was kind of injured…) and I said I was going to at least make it to ten miles, and then I ended up struggling all the way to the finish line. The second year went better (though the 30k was just as boring…) and I met more peeps and got better times. The training seemed to pass by faster this year, and I really don’t remember the marathon being so close to Valentine’s Day. But I still loved it, and I got to have running buddies this time around. I didn’t cry (by sheer force of will) or get angry, and I even had my favorite K-Pop station playing. I wasn’t walking, so the cheering didn’t depress me, and I felt that I actually earned the medal. Takeaways mainly consist of learning how stubborn I really am, and how high my pain tolerance can be. (This and the motto “just keep walking” lead to an incident that left me with bleeding feet after walking up a hill in decorative flats of death. Don’t worry, the blood washed out.) Running also helped me with motivation and managing stress, and continues to help me feel in control of my life. It hurts, but that’s how you know it’s working. As to future fitness, I’m not going to be able to run with Rogue for a while (college), but I’ll reinstate my morning runs, and make use of the campus gym. After I graduate, I plan on joining Rogue.